Clothing distinguishes nobles from peasants. Cloaks with brooches are signs of rank. Nobles’ clothing is smooth, peasants’ rough textured. The important character is larger and the focus of attention. They look directly and try to catch your eye while minor characters look down or away. Young men have short hair, older men longer, lighter hair. Embroiderers need to understand the scene in order to capture the facial and hand expression. Pointing fingers and weapons are carefully aligned to direct attention. So those working on the Fulford Tapestry really need the background story to check the context or ‘meaning’ of the figures and how they need to be worked into the tapestry. The images within the tapestry are designed to tell a story. They are not just pictures. What you see is supposed to convey a message. The images, gestures and position are all there to help the narrative. There is very little that is there for simple decoration. This is exactly the same process used by advertisers and film makers. They try to project images that can be associated with what people understand. Advertisers, in particular, are trying to tell a story with a few images. Since the tapestry is silent and still, it is necessary to load a lot of meaning onto the figures, who they stand, the way they dress and perhaps even their size and position. When you watch a silent, black and white movie, you see a different style of acting and the good guy wears a white hat. These images are icons. So do not look for realism in the tapestry. You need to interpret the images – Perhaps follow the direction of their gaze or a pointing finger or sword. To add extra dimensions to the story in the tapestry, there are margins running along the top and the bottom of the main panels. These might reinforce the main narrative, provide a context for the story or to describe what is going on elsewhere. There is a good reason why medieval designers did not strive to be original. By developing on previous imagery, it was possible to exploit the folk memory. By employing traditional images the designers could tap into this narrative. 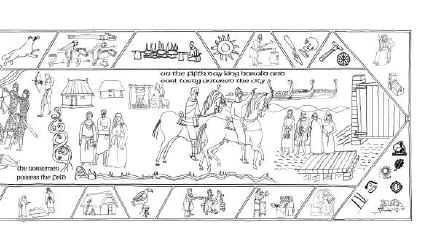 However, nearly 1000 years have passed since the events depicted in the Fulford Tapestry so the plan is to explain what the images are trying to convey. The source of the image is also explained along with an explanation why they were used. Copying, or developing, earlier images was not just to make the work easier but to maintain the tradition used. The design is evolutionary rather than original. The use of English rather than Latin for the text and the incorporation of several modern archaeological devices shows that it is possible to allow the icons to develop. The aim is to tell a picture story. Scholars studying the Bayeux Tapestry have identified the source of many of the images. By identifying the inspiration for a large number of the images, the experts have demonstrated that the design must have been based in England. They found that many had been copied or developed from manuscripts that were located in Canterbury around the time of the Norman Conquest. When you look at the Tapestry you can find some examples where the headgear, clothing or posture is ‘wrong’. Because the probable inspiration for many of the images has been identified, the designer could be accused of taking the source image rather too literally. But transposing headgear from Mesopotamia to Normandy might have been designed to help careful observers associate the image with the biblical story. So the designer might try to associate a known parable with the story they are attempting to tell. This tradition of deriving from previous icons has been accepted and developed in the design of the preface. Most images are derived from an existing picture and the source is explained where it is known. There are some original images because a suitable icon could not be found. The re-enactors who regularly gather in York have provided the model for most of the ordinary folk who are missing from the Medieval record. Every attempt has been made to reflect the dress and other conventions of the time.